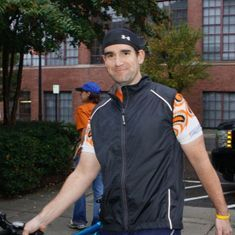 Since 2011, DeMargel has served as an indoor cycling instructor in fitness centers and country clubs in North Carolina and Texas. He currently serves in group fitness departments at The Clubs of Kingwood and The Lake Houston YMCA. DeMargel is known for infusing popular music from the last six decades into a style of indoor cycling that mirrors outdoor riding, popular with both road racing enthusiasts and group class aficionados. Class regulars refer to him as "Rock 'n Roll Matt" for his tendency to favor classic rock hits over contemporary group class music. If you're interested in hiring Matt for a group class or private classes, click here for contact information.